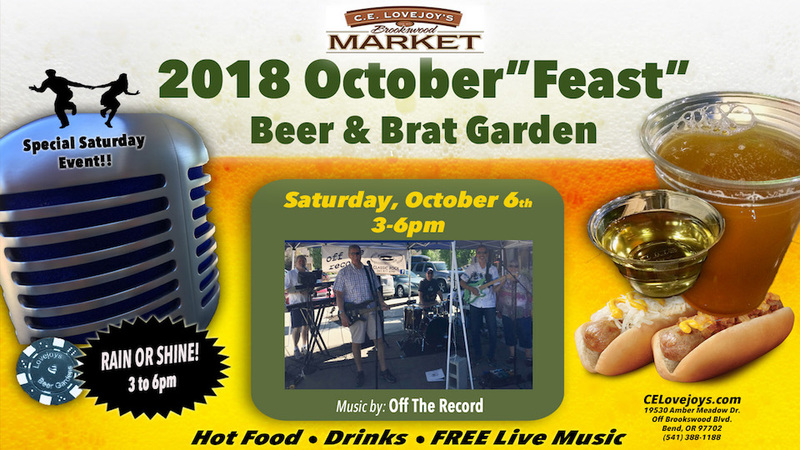 Join friends, neighbors and visitors on Saturday, October 6th from 3:00 p.m. – 6:00 p.m. for a special October”Feast” Beer & Brat Garden at C.E. Lovejoy’s Brookswood Market! There’ll be free live music by “Off The Record” (classic rock), hot homemade brats, tasty local brews and wine. Celebrate fall in Central Oregon the Lovejoy’s way! Find us off of Brookswood Boulevard in beautiful Southwest Bend in the Brookswood Meadow Plaza!